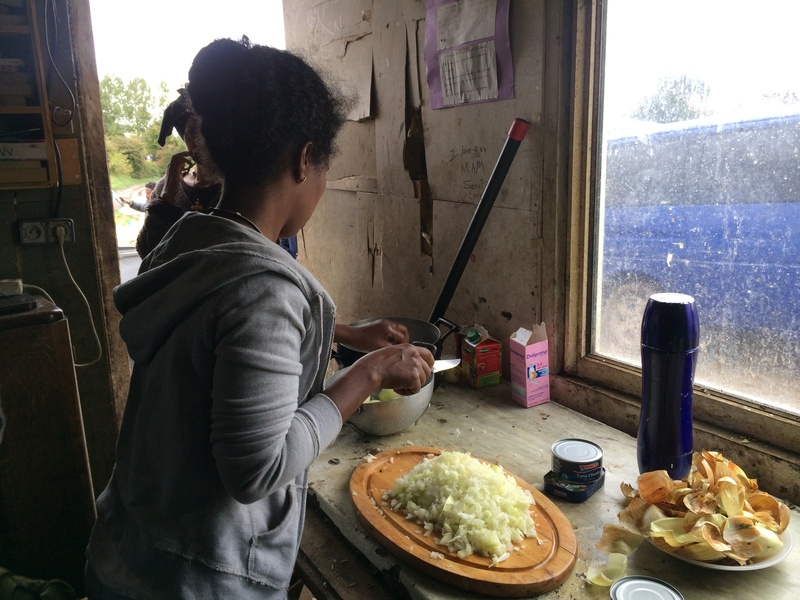 Tess Berry-Hart on visiting the refugee camps in Calais, and what we can do to help. Two months ago at the end of August, I became so saddened by watching the endless refugee crisis playing out on my Facebook feed, that one day instead of working on a play I was writing, I sat down and typed “how to help refugees” into Google. Within three days I had become part of a grass-roots movement called Calais Action, a small group comprised of regular citizens unattached to an official aid agency, collecting waterproof coats, boots and tents to drive over to the inhabitants of the Calais Jungle camp. I set up a West London collection point, and reckoned that maybe I’d manage to collect enough to fill my car, or perhaps a small van, if I was lucky. But over the Bank Holiday weekend with the publication of dreadful photographs of drowned children on a Turkish beach, grass-roots giving suddenly become front-page news. Aid started to pour in from hundreds of people all wanting to help. Other collection points sprang up all over the UK, all similarly reporting unprecedented levels of giving. September dissolved into a round-the-clock whirlwind of generosity and friendship, intense conversations with strangers who appeared at my door at all hours of the night, drawn from all levels of society, giving what they could, offering their time and their hard work to help sort, box and pack the many donations. Amongst my many volunteers were former child refugees, economic migrants plus Mr and Mrs British-Born-And-Bred, all wanting to do something to help – they just didn’t know what. The response was so huge that I had to take over a nearby empty two-bedroom house to house the supplies – a whole sitting room crammed with boxes of clothes, a dining room filled with tents, a bedroom stuffed with food parcels. Originally I’d planned on sending the supplies off to Calais Action’s central warehouse to be shipped to Calais and other refugee groups in Europe. But after a month of busy collecting, it wasn’t easy to switch off. I wanted to see where our donations would end up, and meet the people that they were intended for. So I ended up taking over a van full of tents, clothes and food to both the Calais Jungle Camp and another smaller camp about an hour south from Calais. I’m glad I did. 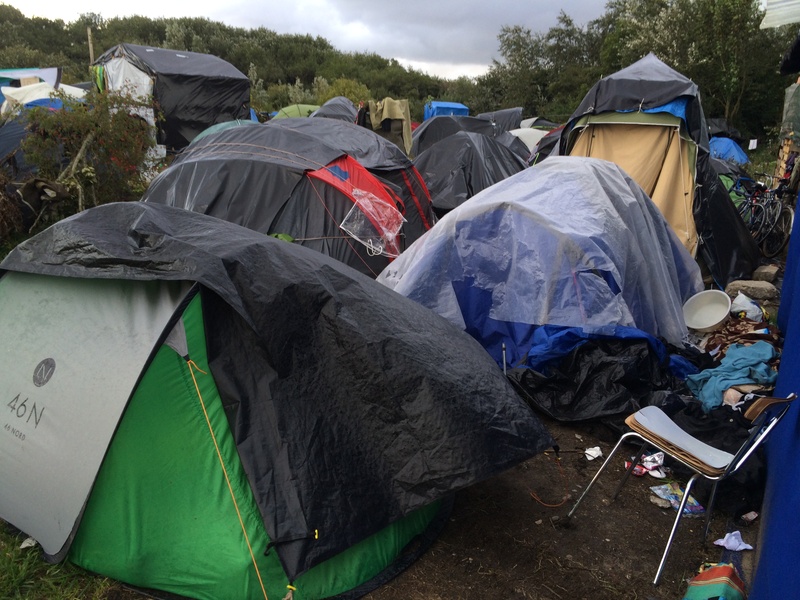 Nothing I’d read prepared me for seeing the reality – that only forty miles away from the UK’s shores and in the very middle of developed Europe there are men, women and children living in makeshift tents in horrible muddy pits that you’d more readily associate with a war zone. International relief organisations are non-existent – there’s no Red Cross, very few toilets, contaminated water and illness are rife, and distribution of food and clothing is managed by a very few French charities and grass-roots organisations and volunteers. 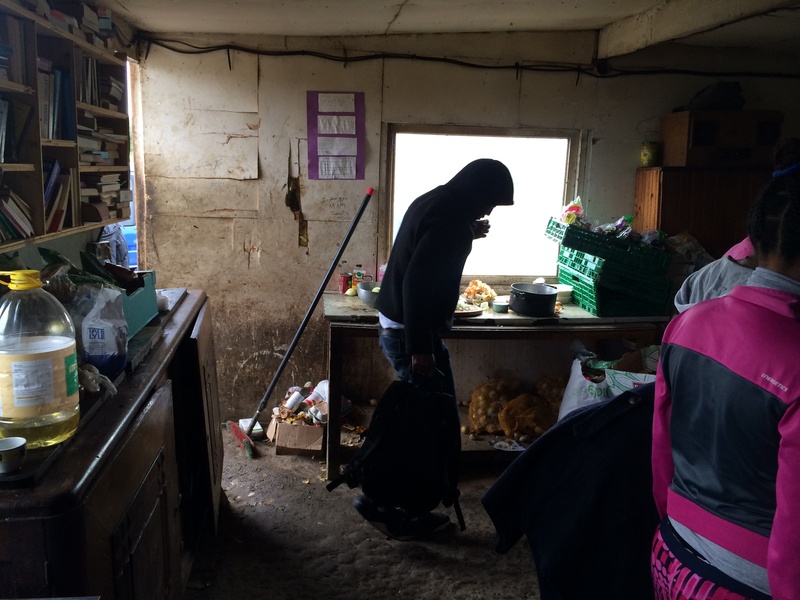 We arrived in the middle of a week of pelting rain which had turned Calais into a flood plain. The landscape shimmered with overflow lakes and dripping, tree-fringed avenues. Our first stop was twenty miles south of Calais, at a smaller camp of around 120 people, which lay just outside a picture-perfect French abbey and up a muddy gravel drive in the middle of nowhere. It had mainly young people in it – about half were women I think, and nobody in the camp could have been over their mid-twenties. One boy I met was twelve years old and was travelling alone from Eritrea. He had a face so lined and worn he seemed way older than he was. No child should have to travel alone across continents. Children like him are desperately at risk of being trafficked or sold into other forms of exploitation by adults. Meanwhile, there was trouble up in Calais for the second day running. Around 300 Syrians and Eritreans had set up a smaller satellite camp outside the Jungle in a neighbouring field, feeling that the main camp was too dangerous (which it is). But without warning or giving them notice to leave, the police turned up and bulldozed the tents, destroying countless passports, identity papers and other asylum evidence in the process. In the ensuing commotion, teargas and rubber bullets were used. Our local activists had received word of this, and loaded up our empty van with a pile of their new tents to replace the ones destroyed. When we got to Calais police were barricading the road and it wasn’t possible to get in, so we spent a while unloading at the new aid warehouse and watching tons of boxes pouring in and putting them in place. When we were able we went in to the camp around the back roads with some supplies for the Jungle Books Library and the tents. The Calais Jungle itself in pouring rain and riots is an apocalyptic muddy landslide of a bombhole, like some kind of nightmarish Glastonbury. Smoke rose from damp cooking fires, dripping tents nestled together between pools of floodwater and thickets of brambles. People wore oversized or ill-fitting clothes and many wore sandals. A woman in a ragged jersey approached and asked for a jacket, I instinctively handed one to her. It came down to her knees, so I took it back and rummaged around in the bag for a smaller one. Rookie mistake. The next minute people were running towards us shouting, “jacket, jacket.” All I’d learned and watched online about how to do proper distribution went out of the window. When someone asks you for something that you’re holding and can give them, it’s impossible to refuse. We beat a hasty retreat round the back of the library and the panic died down. I totally understand the need for proper distribution to prevent a scrimmage, but it’s hard when there is so much need straight in front of you. People were showing us their cold hands and asking for gloves, people were slipping around wearing flip-flops in ankle-deep mud. (Those around us did get some badly-needed shoes luckily enough). It really emphasised that the camp needs LOTS of volunteers who can come over to help distribute all that aid properly in teams, because after my rookie experience I totally understand that you can easily get mobbed by desperate people. If you’re interested in doing this (there’s a whole community over here staying in hostels and getting involved) please see the contact information at the end of this article! I can’t tell you how it felt, knowing that we were driving back to our warm houses and leaving desperate people living in a soaking cold pit. Since I’ve been to the camp, my comfortable life in the UK seems strangely insubstantial, and any problems that we have feel inherently first-world. 2) Political pressure – there’s been Refugees Welcome marches and all sorts of promises by government, but if you want to help really pile on the pressure and can’t get out to the camps themselves, join a letter-writing group like this one following. Badger your MP, make them aware of the conditions and dangers that people face. Here’s a link to a post with lots of addresses to bother people with – an hour’s work cutting and pasting template letters will go far. Some letter-writing groups are co-ordinating so that tons of letters will arrive on a certain day. Check out this post on the Calais – People to People Solidarity Action From UK page for templates and groups. 3) Petitions: There are unaccompanied children in the camps. Those who have made the perilous journey to Europe, like the 12-year old unaccompanied boy from Eritrea who I met – should be given asylum in England. To help give him asylum and allow British families to foster such children please sign this Parliament UK petition and this Change.org petition. Also sign and add your voice to the refugee campaign. 4) Donations – there is limited space in Calais to store supplies, but donations to crowdfunders are hugely valuable – please support the work of the camp library Jungle Books which has started a new crowdfunder to help create a new arts space and provide camp stoves to refugees to help with their cooking, and another to help provide them with winter-proof yurts when the bad weather comes. And finally thank you so much for reading – your help means everything – but let’s not stop here, let’s change this thing! Tessa Berry-Hart is a playwright and novelist. She took the photos featured in this article in Calais.